Steerers - National Electrostatics Corp. 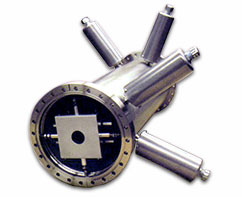 Magnetic Ion Beam Steerer: Provides modest deflection of proton and helium beams with energies in the 1MeV to 5MeV range. 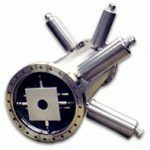 Electrostatic Ion Beam Steerer: Used for applications requiring deflection of ion beams independent of mass. Electrostatic Neutral Beam Trap Deflector: Provides a 3 degree bend and is useful for ion implantation system to prevent neutrals from reaching the target area. Electrostatic Ion Beam Raster Scan System: Used for applications that require uniform ion beam deposition across a large flat target including wafer implantation and ion beam analysis. 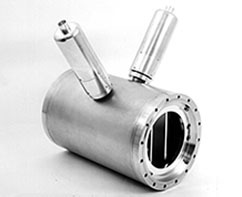 The NEC magnetic ion beam steerer is routinely used with ion beam accelerators to provide modest deflection of proton and helium beams with energies in the 1MeV to 5MeV range. 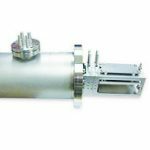 It is a simple and compact steerer that is ideal for adding ion beam directional control to existing 2″ or 4″ O.D. beamlines. Each unit can be used individually to provide control in one direction, with two units required for X-Y steering. They can easily be moved along the beamline for repositioning without breaking vacuum. 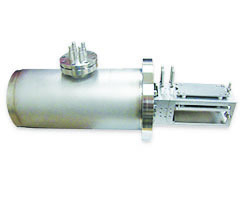 The NEC electrostatic ion beam steerer is used to deflect ion beams independent of mass. 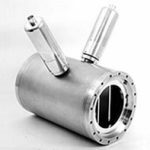 It is routinely used on our injection beamlines for both large and small tandem accelerator systems. The steerer consists of two perpendicular pairs of electrostatic plates. 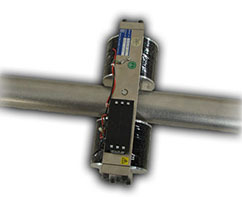 Our standard beam steerer is designed for ±5kV. However, various versions of the steerer are available including ones designed for ±10kV and other customer requested voltage ratings. The NEC electrostatic neutral beam trap deflector was originally designed for NEC ion implanters and is also incorporated in ion beam analysis beamlines on Pelletron accelerator systems. The purpose of the deflector is to prevent neutrals from reaching the target area. The electrostatic deflector is designed for ±25kV potential for a potential difference between deflection plates of 50kV. The assembly consists of two vertical plates to induce a 3 degree bend in the horizontal plane. The plates are tilted with a minimum beam clearance of 2.0″ at the beam entrance and 2.75″ at the beam exit. This allows the passage of a scanned beam without loss of particle transmission. As with the neutral beam trap deflector, the NEC raster scan system was originally designed for NEC ion implanters and is also incorporated in ion beam analysis beamlines on Pelletron accelerator systems. 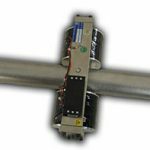 The raster scanner assembly, when used with the related power supply and controller, provides a very reliable system for uniform ion beam depostion into flat targets. The raster scanner assembly consists of four electrostatic plates – two vertical and two horizontal. The entire assembly is contained in a 20cm diameter housing. The raster scanner power supply is designed to be positioned near the raster scanner assembly. It has a ratio of horizontal to vertical scanned frequencies that are crystal locked to optimize scan uniformity. Transformer coupling assures the complete absence of DC offset voltages. The raster scanner controller is equipped with two potentiometers for separate control of the horizontal and vertical scanning plate voltages.Each set of plates can be turned off individually to allow set up of one scan direction at a time. The high energy end of a 1MV tandem Pelletron, with an implant beamline including raster scanner visible in the foreground and an IBA beamline in the background.